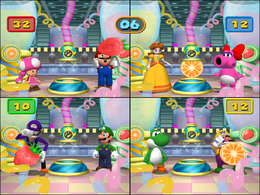 Real Smoothie is an 8-player minigame in Mario Party 7. Its name is a pun on the saying, "real smooth". The two players are in a smoothie factory and have to make smoothies. They stand before a machine that shoots up oranges for orange smoothies and strawberries for strawberry smoothies. The player on the left grabs the oranges and the player on the right grabs the strawberries, and both players will automatically throw the fruits into the smoothie machine. If a player grabs the wrong fruit, production stops for a very brief moment. The team who throws the most fruit into the machine once time runs out wins. The ending animation shows that team's factory continuing to run while those of the other three shut down. Rules – "Throw fruit into the blender! The player on the left takes oranges, while the one on the right does strawberries." Advice – "Don't grab your partner's fruit by mistake, or you'll lose valuable time." Saftladen is commonly used to describe a bad establishment. This page was last edited on March 3, 2018, at 08:25.